Holy water (Theertham) : Chandra Theertham. Timings : 06:00 a.m. to 11:00 a.m. and from 05:00 p.m. to 08:00 p.m. This is the 57th sthalam on the northern side of river Cauvery. Thiruganasambandar & Appar has sung hymns in praise of Lord Shiva of this temple. 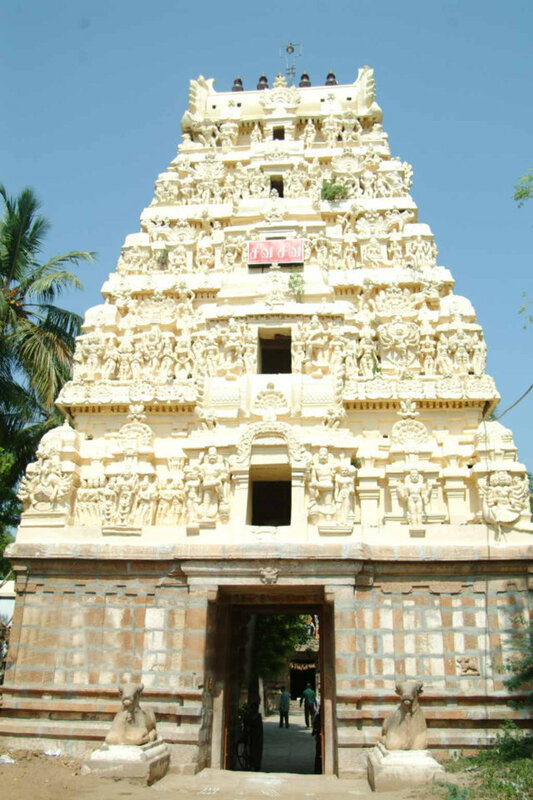 This temple has a 5 tier Gopuram (Tower) with 2 prakarams. The sanctum sanctorum of the main deity and the shrine for female deity are both housed inside the inner prakaram and both shrines are facing east. There are beautiful stone images on the exterior wall of the temple. God Brahma is said to have worshipped Shiva here. Anbil Mariamman Temple is located at very short distance from this temple. 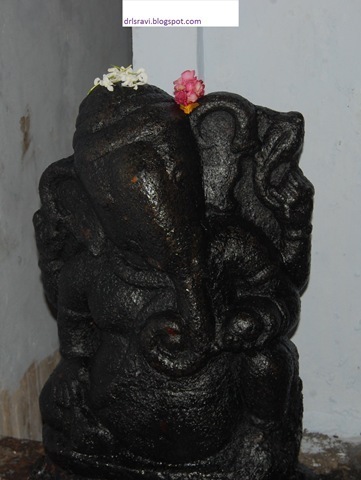 “Sevi saitha Vinayagar” - is seen in hearing posture with head turned to receive the hymns of Thirugana sambandar and he is also called as ‘Saamaveda Vinayagar’, since Jaimini families had done saamaveda parayanam in front of Vinayagar. Moolavar is suyambu on the square aavudayar. 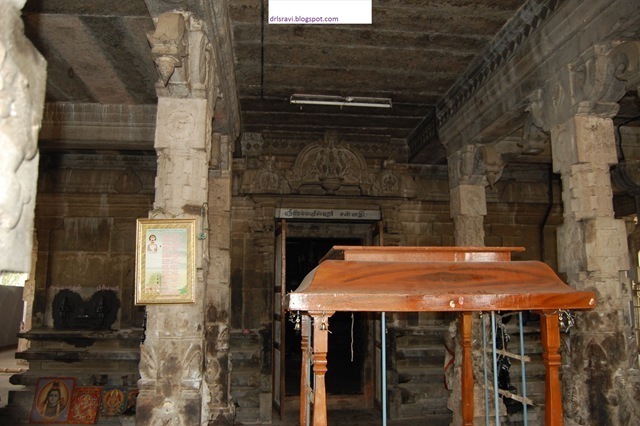 There many sculptures on the front mandapam pillars. Some of them are, Two snakes worshiping Shiva, Snake tail on one side and head on the other side of the pillar. Lord Mahavishnu is present in the place of Lingothbavar. Sanctum is built in “agali type“. Navagrahas are facing Lord Suryan. 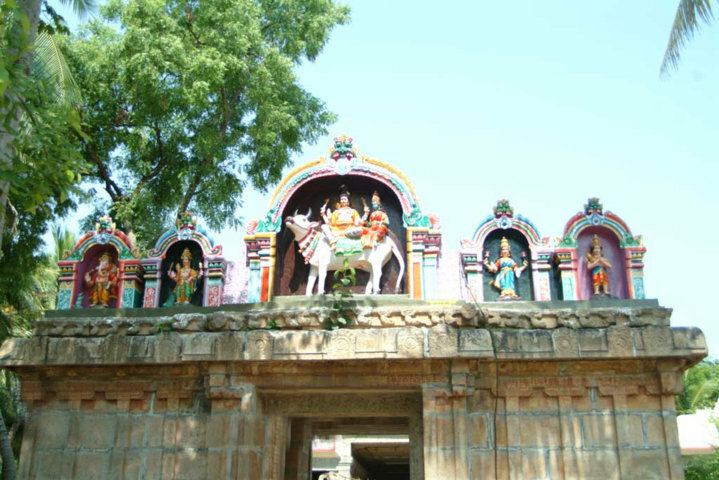 The Saptha Risheeswarar temple at Lalgudi and Tirumandurai Shiva temple are near this place. There are shrines for Sapthamadhas, Lords Bkshadana, Viswanatha, Bhairava, Muruga and Mother Visalakshi in the prakara. 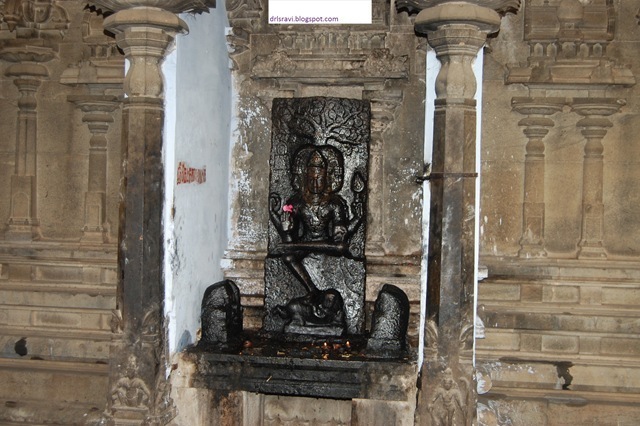 A sculpture depicting Lord Brahmma’s penance is near the Dwarapalakas. The remarkable feature of the temple is the presence of Lord Vinayaka with His big ear leaning on a side – Sevi (ear), Saitha (leaning) Vinayaka – Sevi Saitha Vinayaka. Saint Tirugnana Sambandar fed by Mother Parvathi at Sirkalai and achieving high and ripe poetical skill singing the glory of Lord, was passing through this place. Lord Shiva, to test the saint caused heavy floods in Cauvery. The saint could not reach the place. He sang in praise of Lord from the other side of the river, but the sound could not reach the temple clearly. Vinayaka in the temple with a view to help the saint also known as a Ilaya Pillayar-Younger Pillayar- turned His ear on the direction of the sound and enjoyed the hymns with a smile. He bent one of His legs, sat in a half-sitting form with His ears wide open. A sculpture depicting this story is a masterpiece of temple architecture in the temple. The temple has a beautiful Rajagopuram. The history of the temple is not clearly available. Presiding deity Satyavakeeswarar a swayambumurthy is facing east. He is also praised as Brahmmapureeswarar as He was worshiped by Lord Brahmma. Mother Soundarya Nayaki is blessing the devotees. The name of the place Anbilandurai is a combination of the name of the place Anbil and the name of the temple Alandurai – Anbilandurai. Sage Vakeesa had worshipped in this temple. Sensory organs are very important for all and ear which is one of the five sensory organ used to hear all types of sound is very sensitive.The human ear can generally hear sounds with frequencies between 20 Hz and 20 kHz (the audio range). Human deafness (extreme insensitivity to sound) most commonly occurs because of abnormalities of the inner ear, rather than the nerves or tracts of the central auditory system. People who are having problems in hearing can visit a temple called Sathyavageeswarar temple situated in a place called Anbil in Trichy district. Amman is called Soundranayagi. This temple is more than 1000 years old. 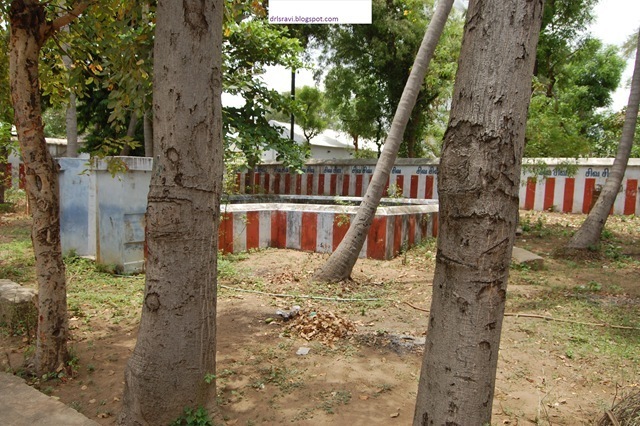 Location: This temple is located at Anbil, a small town 8 Kms east from Lalgudi. 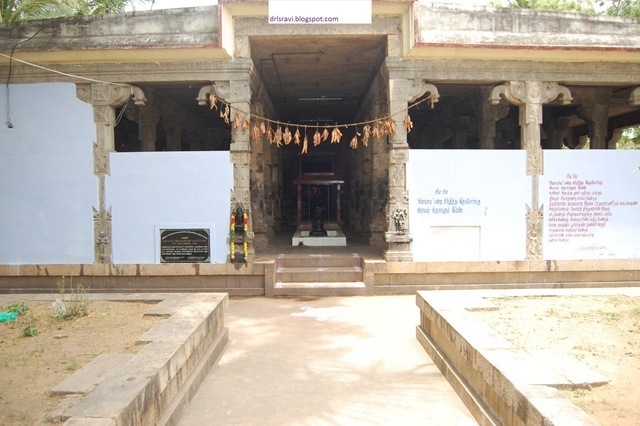 One of the 108 Divya Desam Shrines of Lord Vishnu (Vadivazhagiya Nambi) is located in the vicinity of this temple. Town buses are available from Trichy Chatram bus stand - 28 Kms. Town buses also available from Lalgudi and the distance is 08 Kms. Phone: +91 431 254 4927.